The death toll from a car bombing and clashes between security forces and gunmen near a hotel in Somalia's capital has risen to 18, police said. At least 40 others were injured in the attack near a hotel and a judge's residence on a busy street in Mogadishu, police Captain Mohamed Hussein said. Security forces were still fighting to neutralise some militants holed up inside a building close to the Maka Almukarramah hotel, which the Islamic extremist group al-Shabab said had been the target. He said the death toll could rise as many of the wounded are still being treated in hospitals. Many victims of Thursday's attack suffered horrific injuries and hospitals were said to be struggling to cope with causalities. Some of the wounded lost limbs, said Sadiya Yusuf, a nurse at Daru Shifa, one of the hospitals treating victims. The Maka Almukarramah hotel is frequently used by government officials, and al-Shabab has targeted it multiple times in past attacks that have killed scores of people. The US military command for the African continent reported carrying out 50 strikes in Somalia in 2018. 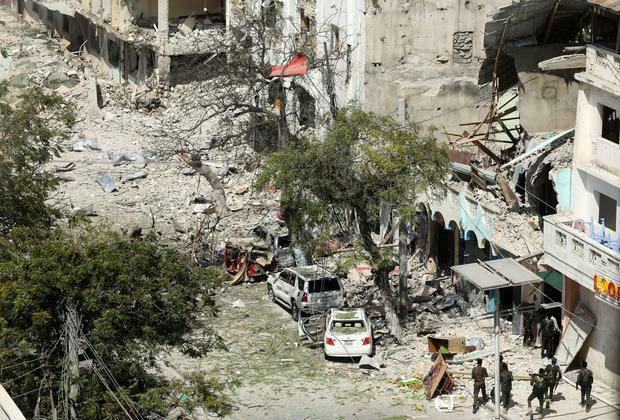 This year, US strikes targeting al-Shabab fighters have come at an even faster pace. The military command in Africa reported 23 as of Tuesday, including one in central Somalia that killed 20 militants and another the day before that killed 35.